Approved according to the new EN443 :2008, the F1SF helmet sets the new standard for fire-fighter's head protection and comfort. Dedicated to structural fire-fighting in buildings, tunnels and other structures, it fulfills the growing requirements of fire soldiers in all urban and industrial operations. Thanks to its unmatched comfort, its adjustable mask attachment feature and its interfaces for accessories, it is a true platform for all critical operations when the helmet must not be a burden for the wearer. 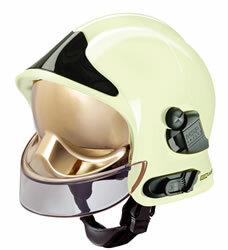 With the reinforced shock absorption system and its new face shield according to EN14458, it keeps its unique style and remains the reference fire-fighting helmet throughout the world.